Team Brandon Valley had a busy weekend in Des Moines – taking on the roller coasters at the Adventureland theme park on Friday and some stiff competition on the basketball court on Saturday and Sunday. Overall, Team Brandon had 20 wins with four teams in championship games! Needless to say, our coaches are pretty proud of all our players and especially happy to lift up these Team Brandon Valley Players of the Week. Our sixth grade girls battled into the championship and earned second place medals. The 14U team dribbled their way into the championship round and earned 2nd place. We're missing a couple of players in this photo - but wanted to recognize our 15U team for their hard-fought championship game and second place medals. The 16U team earned a spot in the championship round and brought home 2nd place. Raygin Bohn, 6th grade: Team Brandon history was made as Raygin Bohn took seven charges throughout the tournament. With a feat that has never been done before in any Team Brandon Tournament, Raygin is certainly deserving of Player of the Week. Coach Klumper noted that in addition to her charges, she gobbled up every rebound in sight and brought her typical maximum aggression on every play. Raygin tells us her favorite subject is social studies. What she likes most about playing basketball is having fun with her friends. Her favorite BV athlete is Felicity Klinkhammer. Austin Brummels, 6th grade: Coach Scholten was proud of how hard Austin played on both ends of the floor last weekend. He owned the offensive end of the court and did an excellent job of waiting for screens – which resulted in multiple three point shots. Austin was a very coachable player and continued to improve through every game. Austin tells us he plans to be a doctor when he grows up. He is motivated by competition, which is his favorite thing about playing basketball. He also shared his favorite BV athlete is Alex Waltner. 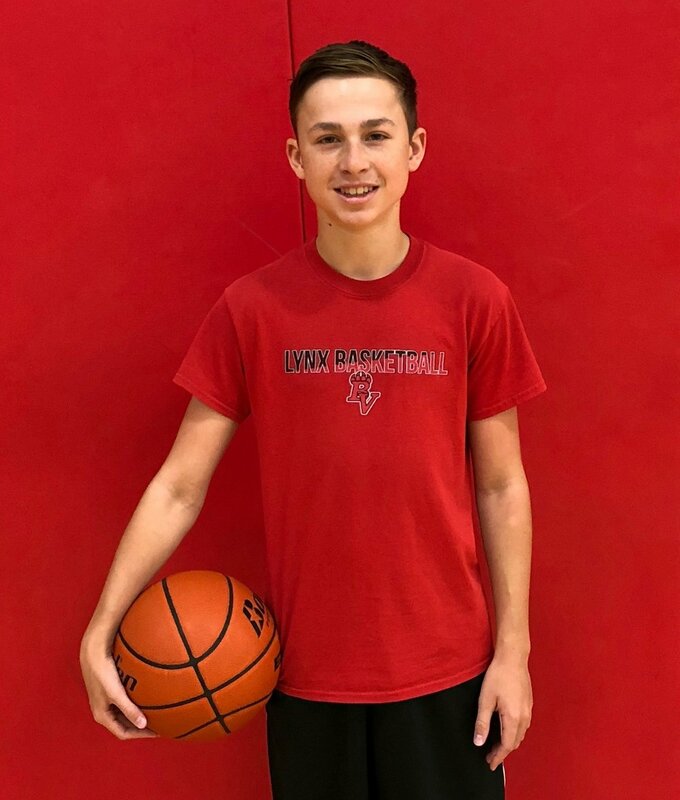 Dylan Langerock, 7th grade: Dylan’s coach shared that he played with intensity last weekend, treating every possession like it was the most important of the game. He attacked the rim and quickly got his team into the offense. Dylan hit some clutch shots that sealed two victories for the team. Dylan tells us he wants to work in the sports industry when he grown up. His most memorable basketball memory is a special buzzer-beater shot that he made against Lennox in the Hardwood Challenge. His favorite BV athlete is Alex Waltner. Brady Giles, 8th grade: Coach Deckert shared that Brady was floor leader for his team all weekend long. Playing with only six players all weekend meant Brady logged in a lot of minutes and took care of the basketball all weekend. Brady's favorite subject in school is math and he plans to be an orthodontist when he grows up. His most memorable basketball moment was beating Sioux Falls rival Memorial Middle School. Brady's favorite BV athlete is Evan Talcott. Riley Peyton, 8th grade: Coach Schultz noted that Riley was a consistent scorer for his team and shot the ball especially well from the three point line. Riley tells us his favorite subject in school is science. His most memorable basketball moment was making a game winning shot for his team. His favorite BV athlete is Evan Talcott. Tyler Westcott, 9th grade: Coach Jurgens noted that Tyler showcased his leadership skills on the court right away this weekend. He showed great effort in every game. He did a great job of communicating with his teammates on the floor. Tyler really impressed his coach with how he stepped up his game to help his team go all the way to the JV championship. Tyler tells us his favorite subject in school is math. In his spare time he plays more basketball and video games with his friends. Jaksen Deckert, 9th grade: Coach Schultz lifted up Jaksen’s hard work on both ends of the floor last weekend. He was a three-point sharp shooter for the varsity team in Des Moines and did a great job of creating shots for other teammates. He was asked to guard some exceptional players and did a good job of forcing them into tough shots. Jaksen tells us he enjoys science class and plans to be a teacher when he grows up. His favorite basketball memory is going undefeated during his freshman year at BVHS. His favorite BV athlete is Dale Moss.